Italian physician; born in Naples; lived at Venice in the first half of the sixteenth century. He attained a high reputation in the Christian world by the following translations into Latin made by him: Zerahiah ha-Levi's Hebrew version of Ghazali's "Tahafut al-Falasifah," published under the title "Destructio" (Venice, 1527); Samuel ibn Tibbon's Hebrew version of Averroes' treatise on the intellect, published under the title "De Conversione Intellectus" (ib. ); Moses ibn Tibbon's Hebrew version of Alpetragius' treatise on astronomy (Venice, 1531). 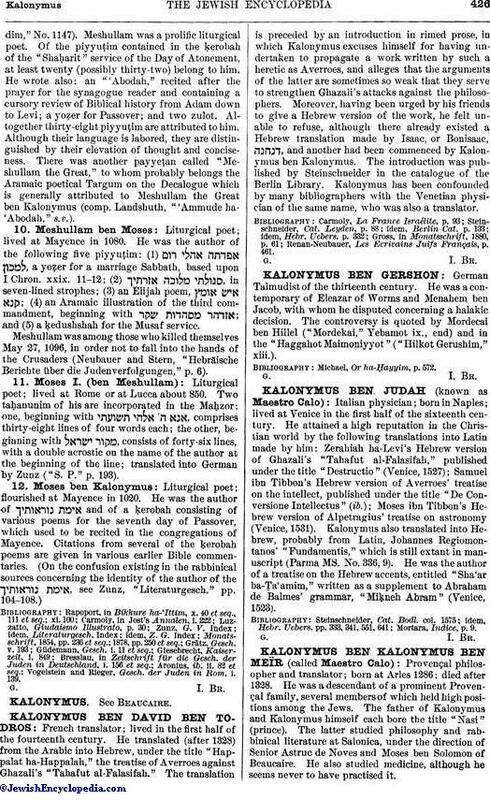 Kalonymus also translated into Hebrew, probably from Latin, Johannes Regiomontanos' "Fundamentis," which is still extant in manuscript (Parma MS. No. 336, 9). He was the author of a treatise on the Hebrew accents, entitled "Sha'ar ha-Ṭa'amim," written as a supplement to Abraham de Balmes' grammar, "Miḳneh Abram" (Venice, 1523).